Terry Velour Fingertip towels with corner grommet so you can hang these towels anywhere you like, popular with golf courses, country clubs and sport events. several different colors to choose from. Have you ever found yourself in need of a fingertip towel, but you didn't seem to have one handy? Meet the full display of wholesale fingertip towels with grommets, available from Towel Super Center. The fingertip towels with grommet are sold with a grommet and hook in packages of a dozen. 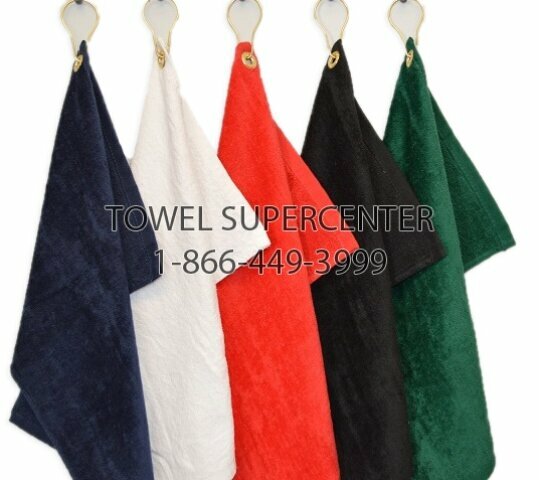 These terry velour fingertip towels come in a rainbow of colors and are designed to be easy to hang. They are perfect for golf clubs, resorts, hotels, health clubs and other businesses. Why Towel Super Center Wholesale Fingertip Towels? These smaller 11x18 towels are a great choice for applications where a hand towel is too large. These are also ideal for quick tidy-up applications where smaller linens make sense. You can use fingertip towels in a variety of applications. They can be hung on a golf caddy for quick cleanups on the course. You can also put these towels out on counters for guests to use at their leisure. At outdoor functions, these towels are great for outdoor dining and fast cleanups. Hosting a golfing fundraiser and don't want to give out traditional hand towels with grommets? Purchase a supply of fingertip towels with grommets instead. They're a bit smaller than regular hand towels, but they do the trick just as well. Plus, they'll keep you on-budget without disappointing your guests, sponsors, volunteers or other contributors. With the grommet and hook, these towels are even more practical because you can hang them up. In nail salons, spas and in other applications, you don’t have to find counter space or room for these towels. The grommet and hook let you hang them from many different types of surfaces. Don't have a business? You can still get all the benefits of having grommeted fingertip towels ready to go. In fact, these fingertip towels make great additions to any household because they're affordable, dependable and convenient. If you’re ready to enjoy these linens for yourself, order from Towel Super Center. We offer these fingertip towels in a range of styles and rainbow of colors, so you can find just the look you want for your linens. Best of all, we provide wholesale prices on all orders and no minimum to buy. You can order as few or as many as you like and still save. Take advantage of our wholesale pricing even if you don’t own a business. Fingertip towels from Towel Super Center are designed to last. Quality cotton material and strong design mean your linens stay soft, fluffy and absorbent after many washes, all while maintaining color. Dense looping and tight stitching are just two of the details designed to make your towel the kind you want at your business or home. The quality design ensures your fingertip towels maintain their shape and integrity even with multiple washes. More businesses choose Towel Super Center for their needs because they know we offer great prices and terrific quality linens. Try us out for yourself and order your terry velour fingertip towels today.